Take 1 vegicap daily, swallowed with water or capsule contents can be sprinkled on food if preferred. Below are reviews of Extra Iron + Vitamin C - 60 Vegicaps by bodykind customers. If you have tried this product we'd love to hear what you think so please leave a review. 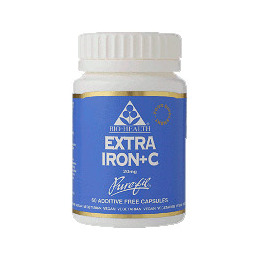 A good, gentle of iron with vitamin C - which is needed to absorb iron. Unlike pharmaceutical iron, this doesn't upset my tum. I have been using this for years and will continue to do so. Bio Health Extra Iron is an essential trace mineral required from the diet to help ensure good health. Its main function is as a constituent of haemoglobin and is sited predominately in the spleen, liver and bone marrow.